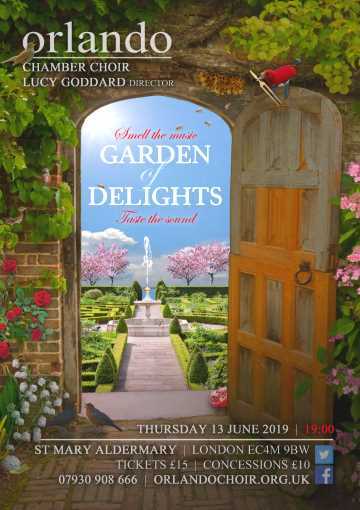 Orlando Chamber Choir presents an all-sensory summer concert with the fragrance of flowers and the sound of Franco-Flemish Renaissance gardens. Our musical plantsmen include Antoine Brumel, Jacobus Clemens non Papa, Cipriano de Rore and Orlando di Lasso, all of whom captured melodies from the biblical gardens of the Song of Songs. There will be secular flora too – polyphony about roses, lilies, vines and other greenery – with Josquin des Prez’s well-known cricket hiding amidst the leaves. Clément Janequin adds birdsong to this musical garden, with singers mimicking starlings, blackbirds and the occasional nightingale. To root this oasis in today’s Central London, we have seeded two contemporary garden-inspired compositions by Janet Wheeler, ready to bloom on the concert day. Orlando’s Garden of Delights is open from 19:00 and, to cater for all senses, will conclude with a communal picnic.